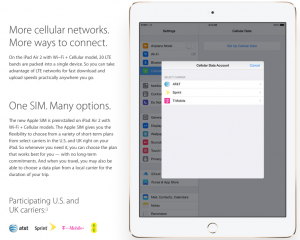 Late this week, various media are reporting that the latest iPads sold in the USA & UK offer the option of an Apple SIM supporting multiple USA & UK mobile operators. If true (and with the evidence, it must be), this represents a fundamental shift in the power relationship between network operators and equipment vendors. Check out the graphic below. Suddenly, the customer can choose EE in the UK and Sprint (or whoever offers prepaid data cheapest) in the USA. The network operator is reduced to providing the bit-pipe, and far worse, the customer can choose between competing service providers at the point of purchase of the service, like we do with buying most other services. Because there is no voice service, there is no need for a phone number – another tie to the operator broken. 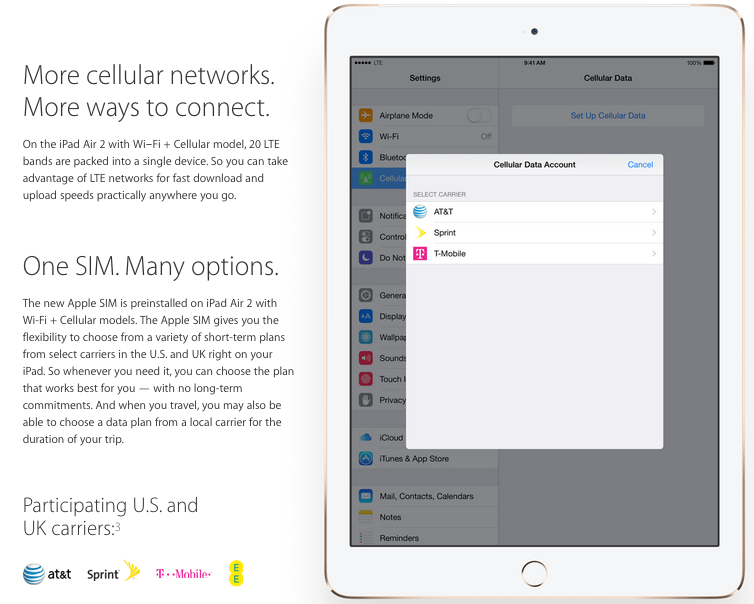 How does Apple replicate the SIM functionality in software? We don’t yet know, but it represents huge possibilities for change in the mobile industry. Of course, there may be economic or usability barriers to using the service which may mean that in practice, the customer is restricted to one operator per country. Even then, it would wipe out roaming revenue from these customers. We look forward to hearing user reports. This entry was posted in International telecoms, Mobile telecoms on October 17, 2014 by Simon Rees.